Experienced educator and scholar Dr. Bilal Philips has written this excellent four-year high school Islamic Studies curriculum. 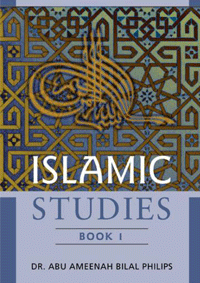 Islamic Studies Book 1, may be used in Grade 7, 8 or 9. Book 1 covers basic Islamic knowledge beginning with the concept of tawheed (the Islamic concept ofmonotheism), and continuing with Qur’anic studies that include the science of tafseer (explanation and commentary) with examples given of select chapters of the Noble Qur’an. Book 1 also covers the science of Hadith and the sources of Islamic law (fiqh). This is a well written, well organized textbook that teachers and students of Islamic Studies will find indispensable. This series have been generally acknowledged as an excellent introduction set to the principles of the Islamic faith, with core sciences discussed and explored, for both the new Muslim as well as the “old” Muslim wishing to brush up on the fundamentals.